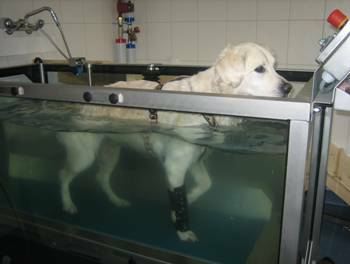 INDIKA-animalreha SA is a competent center for rehabilitation, physiotherapy and osteopathy for dogs and cats. The well being of your animal is our top priority. Our patients are examined and treated comprehensively; classical and complementary medicine are combined in an ideal way. The head of INDIKA-animalreha SA is a veterinarian with an excellent education in neurology, rehabilitation, physiotherapy and osteopathy, a unique combination in Europe. In addition to out-patient treatment we offer hospitalization of animals for intensive daily therapy such as treatment of disc hernia, arthrosis and/or pain syndromes. Your animal may also stay just for a wellness holiday. We offer help and support for all your questions regarding food, diet and proper training for your beloved pet. Of special importance for us is the management of elderly animals and their problems – age is not a disease!